Update: Following what appears to be one of the biggest political miscalculations of May's tenure as prime minister (a span that includes her disastrous general election decision the summer before last), the prime minister has returned to warning rebellious ministers that it's either her deal, or no deal - and if it's 'no deal', lawmakers might want to think twice about the consequences of that outcome. Because if MPs refuse to rally behind her deal, May said, it will increase the likelihood of a second Brexit referendum as the UK seeks to avoid a 'hard' Brexit. In other words, it's either "this deal, no deal, or no Brexit." 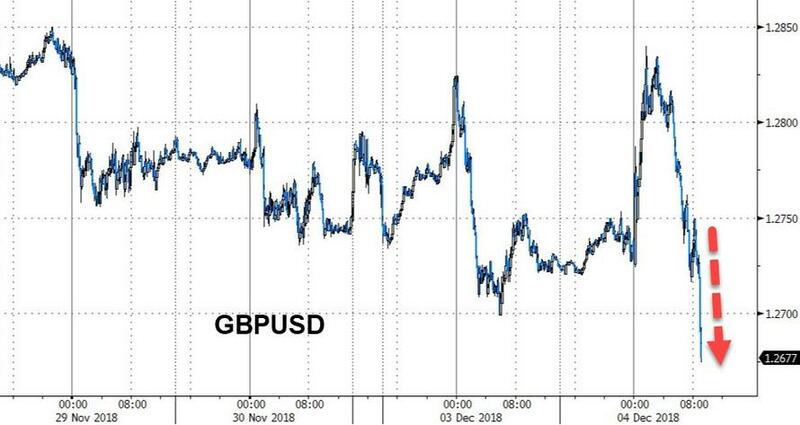 The pound has fallen to its lowest level of the year after Theresa May lost a key Parliamentary vote on Tuesday that will force her administration to publish legal advice that she had hoped to keep secret. After her government was found in contempt by Parliament - 311 to 293 - for defying an earlier vote demanding that No. 10 Downing Street release the full details of Attorney General Geoffrey Cox's legal advice on May's Brexit Treaty. May elicited widespread outrage on Monday when her office released a "detailed summary" of Cox's legal advice that many suspected stripped out controversial findings about the possibility that the UK could become "trapped" within the EU Customs Union if a new trade deal with the EU wasn't reached before the end of the transition period in 2020. A prime minister being found in contempt in Parliament is an action without precedent in recent British history. Cable dropped to a $1.2656 on the vote - its lowest level since June 2017. What's worse, this stunning defeat comes on a day when debate over May's plan was supposed to begin ahead of a planned Dec. 11 vote. Andrea Leadsom, leader of the House of Commons, said the government will begrudgingly release the full legal advice on Wednesday. As analysts were quick to point out, this doesn't bode well for May's prospects for passing her deal. 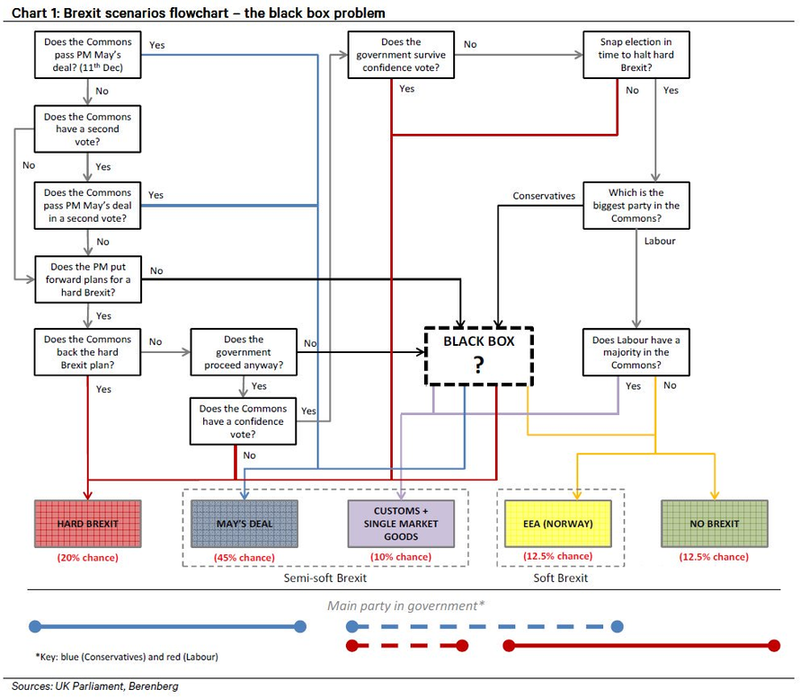 "The outcome from the government contempt vote could be an early indication that the proposed Brexit deal may not pass the House next week," Credit Agricole strategist Valentin Marinov. Now, May's government must decide which version of the legal advice will be released. A "short" version provided to her cabinet, or something more substantial. As a reporter for the Guardian pointed out, Theresa May must have been counting on the support of the 26 Tory rebels who backed the Grieve Amendment (the motion to hold the government in contempt). Otherwise, May would have caved sooner and spared herself the embarrassment. Tory whips must have believed they could squeak this. Otherwise what is the point of allowing the vote to happen to make a finding of contempt? Why not just cave at the despatch box before the vote?